Dr. Vu Hoang will be discussing Self- Force in Higher-Order Electrodynamics. 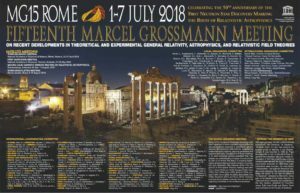 The Marcel Grossmann Meeting is a triennial event where scientists and mathematicians gather to discuss current advances relating to gravitation, general relativity and relativistic field theories, emphasizing mathematical foundations, physical predictions and experimental tests. For more information on the event and presentations clink on the links below.